Parent Mid-Point Conferences are next week. Sign-up boards are up in the front lobby. Students will be dismissed at 1:55 pm on October 17 & 18th. ​Grade 7 Student Volunteer Childminding will be provided during Mid Point Conferences next to the Book Fair, Siblings are welcome. Boundary Elementary PAC​ is hosting an info session for parents on Social Media Education and Internet Safety by Jesse Miller Mediated Reality. Please see information HERE. All parents are welcome to attend from all school PACs - donation of $2 to $5 is suggested. Walk & Wheel: THANK YOU!! Thank you to all those who participated in our Walk & Wheel Events, to promote healthy life choices. We appreciate our guests, parents & Grade 7 volunteers for contributing to such a great event. These events would not happen without volunteers! All students in Grades 4-7 are welcome to join. Choir will be held at 8:00 Thursday mornings in the music room. Montroyal students traveled 133 kms last week and following Terry Fox’s route reached the drive-through fishing community of Little Harbour Newfoundland which is home to only 13 families on the southern Twillingate island. It has a beautiful walking trail which leads to the Natural Arch, This area was once home to now extinct Beothuk First Nation. In 10 days Terry traveled 364 that means for us to match his Marathon of Hope journey, we need to have at least 213 students walk, scooter, skateboard or cycle to school and record it on the chart outside their class room door with a check mark this week. Remind your children to mark how they got to school. The Move It team collects them Friday afternoon. Together we can get to Gander Newfoundland in a healthy and active way. We are pleased to host the Scholastic Book Fair at Montroyal once again! 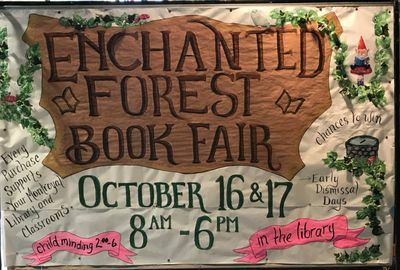 This event is designed to deliver a great selection of reading materials to our students while benefiting the library, classrooms and our reading programs. ​Student Volunteers (Div 1+2) sign up at school. Childminding provided during mid-point parent/teacher conferences, siblings welcome. Sign up sheet for childminding coming up soon. VOLUNTEERS NEEDED! SIGN UP: HERE. Students bringing in donations will be entered to win great prizes !! On October 19 at 10:19 a.m., Montroyal students will join millions of people worldwide will practice how to “Drop, Cover and Hold On” during Great ShakeOut Earthquake Drill. The teachers walk students on what to do in the event of an earthquake. There will be sounds played over the PA. This is a great time to review your family's emergency plan. ​​ Tax deductible donations accepted through School Cash Online. Montroyal has a special promo code PAC-MONT for awesome discounts. If this is your first time supporting our fundraiser through SPUD, enter the code FUNDRAISING at checkout and select MONTROYAL from the drop-down list then complete your order. Your box will be delivered to your home or office and ​25% of your produce box purchase will be donated to our fundraiser! Just say MONTROYAL when making your purchase and 5% is donated to the MPAC. Watch for sign-up boards in the front lobby. Students will be dismissed at 1:55pm. ​Grade 7 Student Volunteer Childminding will be provided during Mid Point Conferences next to the Book Fair, Siblings are welcome. This annual event will be held from 8:00 am - 6:00 pm in the library. Please find all the details HERE. A free presentation focused on general personal emergency preparedness. We will use an all hazard approach and provide information to help participants create an emergency plan, conduct a home hazard hunt and assemble emergency kits. ​See HERE for details & registration. Additional workshops on Emergency Preparation can be found HERE. If parents are interested in having some meetings during evenings or a weekend, Cyndi will consider this. More information about Cyndi, and her contact details, can be found here.